It's shaping up to be quite a month for trail advocates. If you're a biker, a hiker, a dog walker or stroller-pusher, you've probably already gotten out and enjoyed the completed portions of the Waterfront Trail, which currently stretches (in Eureka) from the Hikshari' Trail all the way along the waterfront to down behind Target, looping to meet the Open Door Community Health Center on Tydd Street. 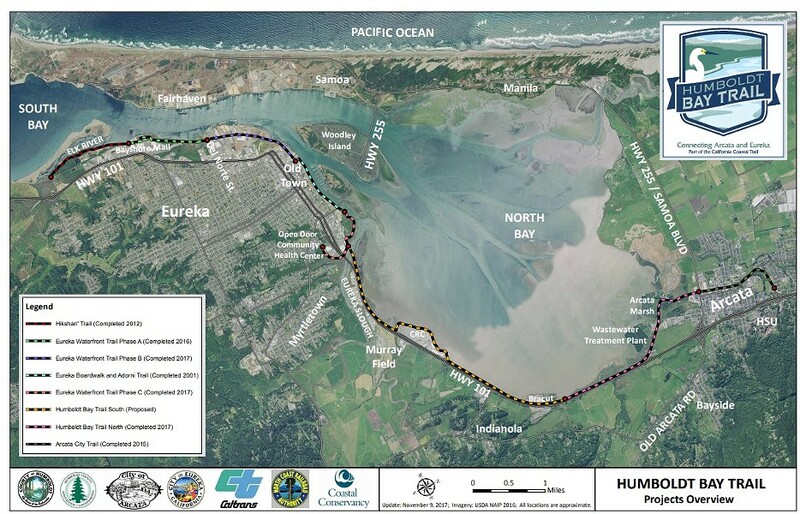 A formal ribbon-cutting ceremony for the Eureka portion of the trail was held on Tuesday and Eureka Community Services (formerly Parks and Recreation) will be screening a documentary at the Wharfinger Building about the challenging and controversial process of putting a trail through the PalCo Marsh on Saturday evening. For some long read reporting on that process, check out last year's two-part coverage, found here and here. 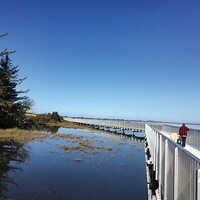 And if you're hitting the trail from the north, you may have biked through the Arcata Marsh and along the west side of the Highway 101 safety corridor only to come face to face with a sign that says "End of Trail" just a little north of Bracut. For the time being, you'll have to fall back on hitting the shoulder of the Safety Corridor, which is nobody's idea of fun. For some backstory on the challenges of (safely) sharing the road, we recommend this 2015 series by Journal contributor and reluctant bike commuter Jennifer Savage. How long will Eureka and Arcata remain unlinked? Well, that's a good question. The county is asking folks to get together at the end of the month to look at its current plans to pave the final 4.2 miles between the two trail systems. This meeting will satisfy the need for public comment on the plan's compliance with the California Environmental Quality Act. According to a press release, this will also be a chance for attendees to learn about "challenges and constraints" to the trail's completion, which might include the relatively narrow land on which they have to build the trail adjacent to the current railroad tracks, and accounting for the issue of sea level rise.